These are two depictions of Saraswati, an Indian goddess associated with knowledge, flow and arts. In Japan she is known as Benzaiten (弁才天/弁財天). The anime figure of Saraswati was donated to the Japanese temple Ryo-ho-ji (了法寺), and monk Shoko Nakazato had it displayed outside the building inside a glass case. As a religious figure it comes as no surprise that high culture depiction of her is prominent. But would you take the anime version of Saraswati seriously in this shape? To some this figure must even feel superficial, tasteless, and almost blasphemous. Is the entity you worship really supposed to look like that? Before you make a judgment, think about the real meaning. What is the actual function of depicting Saraswati? Both representations try to visualize and personify something that cannot be seen. Gods are abstract concepts, and the way to relate to them is through metaphors, associations and humanization. But both representations have the same message: pray to the god. 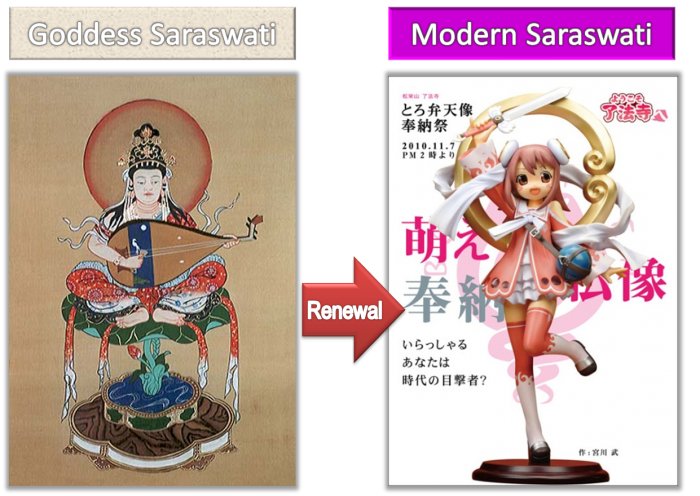 Through which version can young Japanese relate more easily to Saraswati, which one is closer to them? In innovation, it’s not about your taste (sad, but true). According to Morinosuke Kawaguchi, the key is to look beyond the surface, to find out the purpose of the product and include how to bring the purpose to your customers in an appealing way.